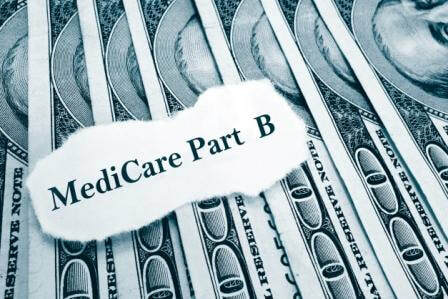 Medicare Part B is the medical expense part of Medicare and pays for covered services that are medically necessary whether received at home, in a hospital, in a nursing home, or at a doctor’s office. Coverage under Medicare Part B is elective and requires the payment of a monthly premium, which is deducted from a person’s Social Security retirement benefit. Most beneficiaries pay the standard monthly premium of $104.90 (2016). However, for some beneficiaries (those who first enrolled in Part B in 2016, higher-income beneficiaries, and those not receiving Social Security benefits), the monthly base premium rose to $121.80 in 2016. And, some higher-income beneficiaries pay an additional amount, which is based on their adjusted gross income. Note: If you do not sign up for Medicare Part B when you first become eligible, you may be able to sign up during the general enrollment period, which runs from January 1 through March 31 each year. However, the cost of Medicare Part B will increase 10 percent for each full 12-month period that a person could have enrolled in Medicare Part B but failed to do so. The amount that Medicare pays for a given service or physician is based on a national fee schedule that assigns a dollar value to each service. That amount is the maximum Medicare pays. If a physician accepts Medicare assignment, then he or she has agreed to charge no more than the Medicare approved amount; the bill for the service is sent directly to Medicare. If the physician does not accept Medicare assignment, the patient is billed directly and is responsible for all charges that Medicare does not cover or approve. Note: If a person is covered by Medicare but is still working and participating in an employer sponsored health plan, Medicare will be the secondary payer. This means that Medicare pays for covered costs only if those charges are not covered by the employer plan. As we just saw, the coverage’s and benefits Medicare provides are by no means complete. Because of its web of deductibles, co-payments, limitations, and exclusions, Medicare leaves many gaps in its coverage. To fill these gaps, an individual has two options: a Medicare supplement plan, sold by private insurers, or a Medicare Advantage plan.